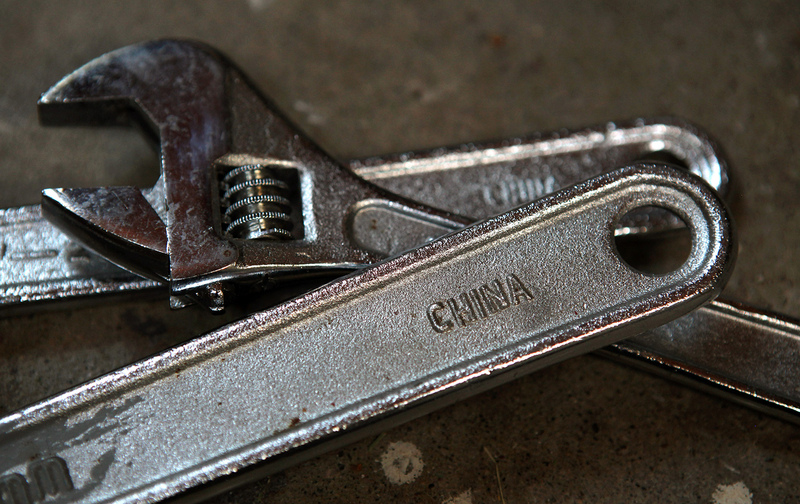 ‘CHINA’ embossed on the handles of forged steel wrenches in San Rafael, California, August 16, 2010. After a poor roll-out of the pivot to Asia, ineffective tariffs against Chinese tires, and a North Korea policy which failed to sufficiently engage Beijing, it’s clear that America’s policy on China under the former Obama administration could have been more effective in achieving American goals. Former U.S. Ambassador Max Baucus recently expressed his own frustration over Washington’s weakness and lack of long-term thinking during his three-year tenure in China. Rein in North Korea: Despite Beijing’s rejection of the idea that it holds the key to reining in North Korea, many in U.S. policy circles emphasize the importance of increased pressure from and cooperation with China. Boost the American economy with a more symmetric trade relationship: Since 2004, the U.S. has filed 21 dispute settlement cases against China in the WTO, many resulting in rulings favorable to the U.S. Commerce Secretary Wilbur Ross hopes that trade tariffs or quotas could force China—and others—to the bargaining table. Achieve a badly-needed win: Trump was tough on China throughout the campaign, but quickly turned away from promises to label Beijing a currency manipulator. Facing recent controversies and defeats—the failure of healthcare reform, ongoing Russia investigations, and little progress on signature issues like tax reform and infrastructure—Trump may be looking for a quick win that doesn’t require Congress. Depending on which outcomes he considers most important, the president may consider different policy options. If he wants to bring China into the fold on North Korea, there are more effective actions the U.S. can take. A more aggressive path of introducing trade tariffs could have potentially disastrous knock-on effects, risking a wider trade war. David Dollar of the Brookings Institution suggests a more balanced approach of restricting acquisitions of U.S. companies by foreign state enterprises. Such an approach, he says, would pressure China to loosen its own restrictions on certain sectors, though this approach is unlikely to generate the quick results and big headlines that seem to motivate Trump. If Trump is looking for a quick win, he could go forward with tariffs against China in order to drum up domestic support and signal to China that more confrontation may lie ahead. Starting with a targeted approach on Chinese steel exports, for example, leaves the door open for more punitive actions which would ratchet up the pressure on Beijing and countries that transship Chinese steel. If the Trump administration chooses to employ tariffs or quotas, it needs to walk a tightrope between inflaming international trade tensions and harming U.S. producers who rely on steel imports from around the world. If tariffs don’t bring others to the negotiating table, production input costs could increase drastically, ultimately hurting the very workers Trump says he wants to help. The U.S.-China trade relationship has been hugely beneficial to both countries, delivering jobs in China and cheaper products to the U.S. Those benefits have been evident in the speed of the build-up in bilateral trade, which topped U.S.$525 billion in 2016 according to the International Monetary Fund. U.S. exports to China have more than doubled and imports have almost doubled over the last 10 years. Of course, the U.S. still has a large trade deficit with China, but Donald Trump’s reduction of the debate to the size of the trade surplus is a huge oversimplification. This is not least because many Chinese goods shipped to the U.S. contain a high degree of value-added content that comes from other sources (including the U.S.). Nonetheless, there are some sensible reasons for arguing that the U.S. should take a tougher approach towards China on trade. The most important is that the current global trading system is ultimately built on certain key principles. Among these, two of the most important are reciprocal access to markets and a commitment to refrain from export subsidies. China is testing other countries’ patience on both these fronts. The president’s claims that China enjoys unfair advantages when it comes to exporting to the U.S. have some grounds then, although it should be noted that the U.S. record on indirect export subsidies is not exactly unblemished either. For all of the concern about the Trump administration taking a hardline approach, most of the measures being discussed at present are in fact pretty mild. It has, for example, been correctly pointed out that steel tariffs would not do much to affect the trade balance with China, because the U.S. does not import much steel from China. For exactly this reason, China would probably not react too aggressively in response, though its rhetoric would certainly heat up. If Trump genuinely wants to move the needle on China’s trade policy, he will need to be prepared to play a much tougher game. The Chinese government has learned under successive U.S. administrations that offering insubstantial tidbits is usually enough to alleviate the pressure to increase access to its markets. Unlearning this lesson could be a painful process. Meanwhile, nothing about Xi Jinping’s government suggests that it is very interested in opening the economy further to foreign firms. Indeed, a substantial liberalization of trade and investment in fast-growing fields such as high-technology, telecommunications, finance, and cultural media would be seen by many in the Chinese government as a challenge to national security. Adopting the sort of trade policies that might shift the Chinese government’s view about where its national interest lies on the argument about trade and investment would create multiple risks for the U.S. government. It would likely escalate security threats from Korea to the South China Sea and face substantial push-back from U.S. firms with interests in China. Given that his administration is already embattled at home, Trump might be wiser to settle for more tidbits. It is no surprise that the Comprehensive Economic Dialogue ended in disappointment. China is opening up at its own glacial pace and the U.S. has little leverage to speed the process. It is tempting to turn to hardball, but most measures under discussion would backfire. The first decision up is the 232 judgment on whether steel imports into the U.S. are a national security threat. They are not, but facts may not play much role in the debate. Another relevant fact is that the U.S. imports very little steel from China. The main exporters to the U.S. are allies Canada, Mexico, and South Korea. Steel tariffs will hurt these allies and the many industries in the U.S. that use steel. They will have little effect on China, though they will have some indirect effect as they depress prices in the world market where China is a big player. Second, we could return to some ideas from the campaign such as a 45% tariff on “Chinese” products. I put Chinese in quotes because modern trade consists of complex value chains such that products imported into the U.S. from China contain a lot of value added from the U.S., Japan, South Korea, Taiwan, and others. These tariffs will hurt a lot of U.S. firms and workers, not to mention allies. Even without retaliation protection tends to reduce one’s exports by raising production costs and the exchange rate. Add it guarantees Chinese retaliation in a diverse set of sectors from aircraft to agriculture to financial services--and the result is not likely to be good. Historically, U.S. protectionist efforts have generally gone hand-in-hand with bigger, not smaller trade deficits. Third, the overall trade deficit is something to worry about, but it is primarily a macroeconomic phenomenon. To reduce its deficit the U.S. needs to save more through stronger incentives for private saving and reducing the fiscal deficit. For example, a tax on carbon that is partly used to finance infrastructure and partly used to reduce the fiscal deficit would lead to a lower U.S. trade deficit and a healthier U.S. economy. One bit of hardball that I have endorsed is limiting the ability of foreign state enterprises to buy our firms. There are not that many such transactions so this would not have a big effect, but it would catch the attention of the Chinese leadership and be one small step towards a more level playing field since our firms are shut out of so many sectors in China. There are two questions at play here: first, should Trump use Section 232 to place quotas and/or tariffs on imports of steel; and second, should Trump play hardball with China over trade? The answer to the first question is a clear no; others have already covered how damaging tariffs would be to the U.S. economy and its relationships with close neighbors and allies. President Trump has already displayed his ignorance on the issue, referring to other countries’ “dumping” of steel, an argument that is distinct from Section 232’s national security framing, and which may open up further avenues for legal repercussions through the World Trade Organization. The second question deserves more consideration. The short answer is yes, but Trump likely lacks the vision to play hardball successfully. The reason for playing hardball has more to do with China’s vision for the future of the global economy, and less to do with short-term deficits. Despite President Xi’s pleasant nostrums presented at Davos earlier this year, China is no champion for globalization. Rather, the combination of its trade and investment restrictions, its industrial policy, its Internet restrictions, and Belt and Road Initiative all point towards a world in which the world buys from China but China itself is self-sufficient, resources aside. It is a vision of a one-way autarky of sorts, with China at the center. Supporting this goal are purchases of high-tech semiconductor, robotic, and similar firms in Europe and the United States. Often these purchases are funded by state-backed financial conglomerates. The IP is then brought back to China where it is integrated into domestic R&D efforts. Just yesterday, China released a plan to support the development of its AI capabilities over the coming decade. This is currently being advanced by China’s employment of American researchers in San Francisco. The implications of continued IP loss and reduced innovation and competitiveness are far more threatening than a bilateral trade deficit. China’s vision for its role in the future economy is inimical to the U. S. vision of open borders and free trade. But whereas China is moving forward in a relatively clear direction with broad support for its goals, the United States and Europe are arguing over the fairness of trade. To play hardball, Trump must unite not only domestic constituents as well as allies in Europe and elsewhere to place greater oversight on Chinese foreign investment, not just by large state-owned enterprises, but by venture capitalist and private equity firms as well. Additionally, these countries must let China know that they will not tolerate continued lack of access to China’s domestic market while China undertakes its efforts in the Belt and Road Initiative and other related programs. This is not about punishing China, rather it is about maintaining a level playing field for all, one with clear rules and a respect for law. This is a monumentally difficult task, one that requires the high levels of leadership, vision, and diplomacy. But it is necessary to defend the global economic order that has served America and the world for the last century.